There has been a new buzz word added to the education lexicon of late (as if one were needed) - the flipped classroom. This is an idea thats not so much brand new or revolutionary as it is one whose time has come. Technology now allows anyone (ie. any teacher or lecturer) to quickly and easily record and share lesson demonstrations online. Access to such a capability is now allowing teachers to schedule the content-consumption aspect of the curriculum as pre-lesson time work so students view it in their own time and come to a lesson already with a basic understanding. Thus the lesson is 'flipped' and class time can focus on discussion, interaction and tasks that build upon the basic content, rather than just on the content itself. Case in point is Salman Kahn whose prolific creation of online science and maths lessons is often cited as one of the best examples of the flipped classroom. Salman is not a trained teacher, but through his creation and sharing of the online Khan Academy, and indeed by using tools like a video camera and YouTube, or even a mobile app like 'Explain Everything', any teacher can provide students with content that prepares them for lessons that they can access in their own time, at their own pace. Indeed, students world-wide can also access (and create) such content themselves, without having been directed by a teacher to do so. There is understandably much potential in this model thanks to the extra ease and accessibility current technology such as ubiquitous video cameras and internet access is providing it, but it is by no means an answer of itself. In fact, too much focus on the technological side of this model could be its downfall if educators use this aspect as a substitute for a solid curriculum and pedagogy underneath the learning itself. This is a trap that many ICT in education programs have fallen into in the past. One high-profile example where the focus on the tech itself has at times become the problem rather than the enabler is the One Laptop per Child (OLPC) initiative started by Nicholas Negroponte at MIT university in the United States. This project has five core principles: child ownership of devices; low ages as the target; saturation of whole schools; connected learning; and free and open source software. It has delivered over 2.5 million XO personal learning devices to countries across the world. But what does their strategy for supporting and nurturing the learning experiences that the XO can enable look like? 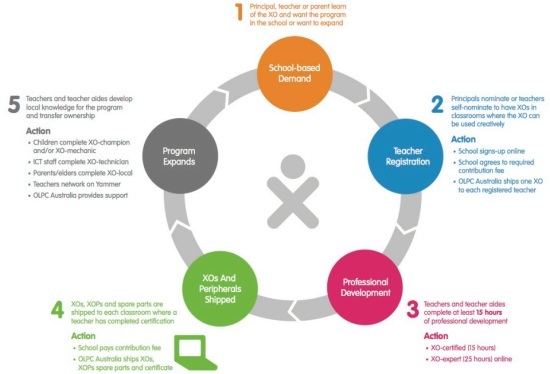 This is the introduction of Jonathan Nalder's "One Laptop per Child Australia 'flips' the ICT in education deployment model" and is reposted here with his kind permission. Resumen en español: El texto es la introducción de un artículo sobre el model "volteado" de la implementación de los TICs dentro de la educación que está siendo utilizado por OLPC Australia. El autor Jonathan Nalder ha puesto una traducción al español hecho con Google Translate al fin de su artículo al fin de la versión completa en su pagina Web. Thanks OLPC News for helping us share some news from our corner of the mobile learning/ community development world. Happy to discuss and answer readers questions as I can. Lidia, lo siento que había olvidado de incluir el resumen en español. Como el artículo es muy largo decidi poner un link a la traducción automatica que Jonathan pusó en su pagina Web, espero que esto te ayude un poco. Muchas gracias. No tengo inconveniente en leer inglés. Entendí que este trabajo en inglés era un resumen y estaba disponible también en español al final de la versión en inglés. Pregunté por la versión en español para no dedicar tiempo a una traducción y utilizar el texto con fines académicos. Gracias. Jonathan, thanks a lot for adding the Google Translated Spanish version to your article. I've now updated the post to point people to it.